Last summer, the Seward Park Cooperative, which owns a commercial strip east of Essex Street, signed a long-term lease with 7-Eleven, after a group of residents opposed to the presence of more chain stores on the LES unsuccessfully tried to find an alternative tenant. Construction finally got underway a few weeks ago. The corporation, in the midst of a major New York City expansion, came to hear feedback about potential products to be sold in the store and other issues. The gathering in a co-op community room was led by Scott Teachenor, who oversees around 150 stores in New York City and surrounding areas. He said the Grand Street location will be a corporate training center and, as such, will never become a franchise operation. Because it’s going to be a training site, the store, he said, “will be held to an extremely high standard.” A July 25 opening date is anticipated, although that could be pushed back depending on the pace of construction. Categories: 7-Eleven US Locations | Tags: 7-Eleven 403 Grand Street | Permalink. Just when you thought the perpetually forthcoming 7-Eleven at Avenue A was cleaning up its act! 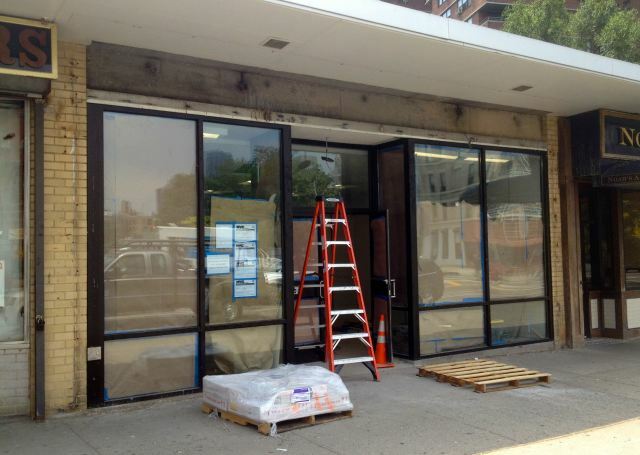 Last week workers removed the shanty-chic plywood structure surrounding the new 7-Eleven at 170 Avenue A only to rebuild it a little bit smaller. Hopefully this one won’t fall apart. 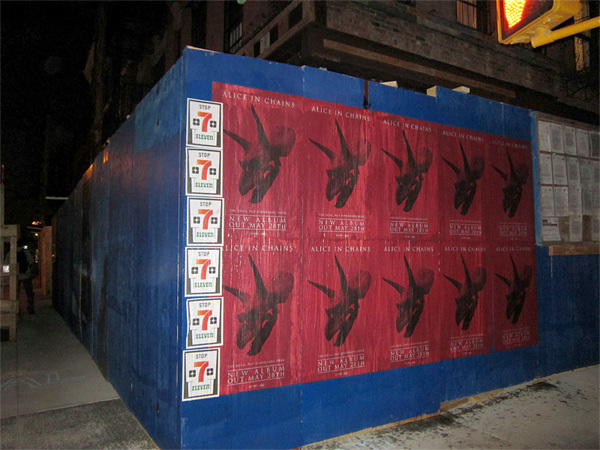 In other 7-Eleven related news, Bowery Boogie is reporting work has begun on the new 7-Eleven at 403 Grand Street. This 7-Eleven is corporate run/owned and is the second new 7-Eleven within a three block radius. Categories: 7-Eleven US Locations | Tags: 7-Eleven 142 Delancey Street, 7-Eleven 170 Avenue A, 7-Eleven 403 Grand Street | Permalink. We’re getting more information this morning from the The Lo-Down regarding the new 7-Eleven coming to 403 Grand Street on the Lower East Side. The most significant news is 7-Eleven has signed a 10 year lease and will be a “corporate” location. A sign was placed in the window of 7-Eleven soliciting franchisees but was quickly removed. 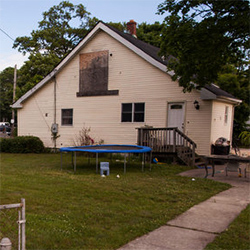 The store has been presented to the community as a “corporate” location. In other instances, 7-Eleven has opened stores, and then later converted them to franchises once local owner/operators were identified. This was the case with another 7-Eleven outpost at 142 Delancey Street. According to the company’s web site, it’s still available as a franchise opportunity. But Seward Park General Manager Frank Durant tells us this morning the Grand Street location is definitely a permanent corporate store, the signage was put up by mistake and it’s going to be removed. Seward Park General Manager Frank Durant says 7-Eleven plans to solicit feedback from community members about what sorts of products and services people would like to see in the store. 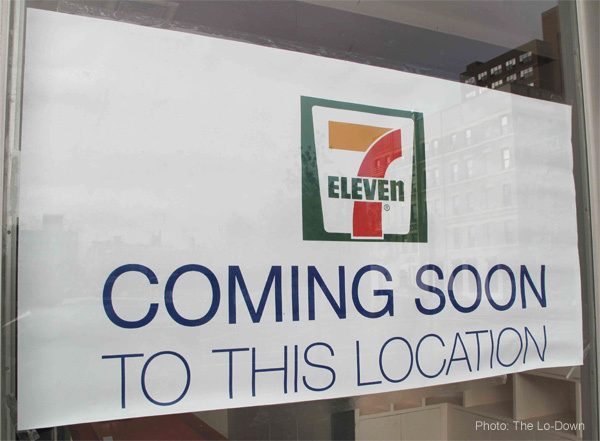 7-Eleven recently opened another location right around the corner at 142 Delancey Street. 7-Eleven plans to open an additional 100 stores in Manhattan. Categories: 7-Eleven Manhattan Locations | Tags: 7-Eleven 142 Delancey Street, 7-Eleven 403 Grand Street, Corporate Location | Permalink. We are hearing from our friends at Bowery Boogie that 7-Eleven is opening another location at 403 Grand Street on the Lower East Side. 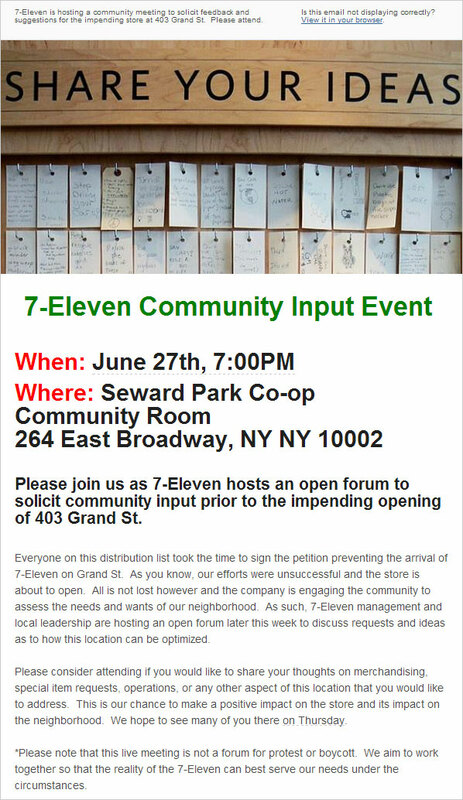 Despite local backlash against the presence of a 7-Eleven at this location, the Seward Park Co-op board caved and is allowing a 7-Eleven to occupy the space. Residents have already begun to vocalize their contempt for 7-Eleven. 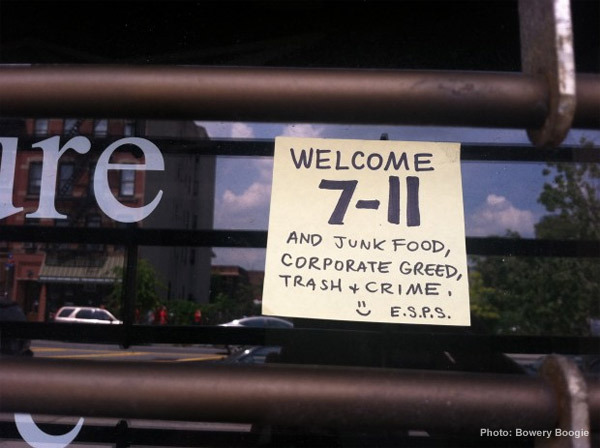 “Welcome 7-11 and junk food, corporate greed, trash + crime,” reads a Post-it left on the storefront. Categories: 7-Eleven Manhattan Locations | Tags: 7-Eleven 403 Grand Street, Ken Barnes, Lower East Side | Permalink.